C86799A: 04-12 Chevy Colorado Xtreme Billet Grille Insert (2pc). This polished billet grille insert has an approximate installation time of about 1 hr. With an Insert type billet grille, you don't see the stock grille behind as you do with the Overlay. Modification is required to OE factory grille. It comes with complete directions and hardware. 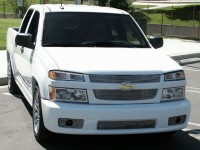 Bumper billet grille is available above as optional item. Backed by manufacturers one year warranty. Imported. Tell your friends about the Colorado Xtreme Billet Grille Insert (2pc). Share this product on Facebook, Twitter, MySpace or send an email to a friend!